I am pleased to provide an overview of the management of the Dante Alighieri Society over the past year. As the Society will shortly be celebrating a major milestone in its history, the 60th anniversary of its foundation in Canberra, it is fitting that we take a few moments to look briefly at how we got here. As you would all know, the worldwide society of which we are part has the two-fold mission of promoting Italian language and culture, and of stimulating a desire among foreigners for Italian culture and society. From what we can gather, the first committee of the Society established in June 1957 was certainly imbued with such a mission. The first president was the world renowned classical archaeologist, professor Arthur ‘Dale’ Trendall, then ”Master of the House” at the university college that later became the ANU who was an authority on the life and culture of the ancient Greek colonies of South Italy. Another admirer of Italian culture, the eminent historian and ANU professor Sir Keith Hancock was the vice president. The then ambassador was honorary president and together with the architect Enrico Taglietti made up the Italian component on the Committee. With such illustrious persons running the society there seemed to be little room for the common folk, and membership of the Society was seldom more than a handful. You could just imagine these personalities getting together in front of the fireplace in the Fellows Room at University House with a glass of port and a Cuban cigar in hand to discuss the masters and treasures of the classical age. This early committee slowly morphed into a slightly more open group and attracted a small following of community members with elitist aspirations. It retained its link with the classics area of the ANU with a succession of professors as presidents. When I came to Canberra in 1975, the Society had a small membership of about 20 and apart from the occasional talk by some eminent personality, its main activity was to run a couple of small adult Italian language classes at the ANU. As an ex junior member of the Dante Committee in Sydney I received several invitations to join the Society, but not being a fan of its elitist presumptions I declined. Things began to change in the late 1990s when some people with a broader vision became active in what was by then an almost dormant Society. Under the leadership of Prof Joseph Lo Bianco assisted by Ottavio Bagozzi and others such as Sante and Loredana Modesti, the Society actively pursued a wider membership and greater attention was devoted to the teaching of Italian. Administration became more disciplined and the Society became an incorporated association with a new constitution in 1999. Funding from the Italian government in support of language classes was also secured and the number of classes began to grow rapidly. However, because many of the classes were too small to be financially sustainable, the Society suffered some potentially distressing financial pressures. In the early 2000s, I finally agreed to join the reshaped Society at the urging of Joe Lo Bianco and was conscripted to its Committee to help with a major restructure of the society to safeguard its financial stability as well as expand its cultural and community activities. With Joe’s departure to Melbourne at the end of 2003, I became President for what I naively thought was going to be a short period to complete the restructure and establish strong foundations for the future. Within a couple of years, the resulting financial strength enabled the Society, not only to withstand the rapid reduction and eventual loss of Italian government funding, but also to extend the range of services to members. The Dante Alighieri Foundation was established to create a ‘trust fund’ that could be accessed to help sustain the Society in hard times. As you will hear a little later in the Treasurer’s report, the Foundation has provided significant support to the Society during the course of the recent economic downturn. We also attracted some very talented and committed people to the Committee who were instrumental to the success. Yvette Devlin, who unfortunately is about to leave us, has made a huge contribution. Other major contributors in this period include Margaret Mathews, Francesco Sofo, Sam Palma, Orlando di Iulio (urged and assisted by Catharina), Mario Rosi and Sue Hancock. The choir, our wonderful ambassador to the wider Canberra community, was established under the leadership of Francesco Sofo during this period and continues to make us proud. The Society has also become much more involved in Italian community affairs and is now probably the most active Italian organisation currently operating in Canberra. As we reflect on the past 60 years, we have a lot to be proud of and our gratitude goes to the many people who have contributed greatly to the success. There are too many to mention tonight, but they will all receive appropriate recognition in a short history of the Society to be publish as part of the 60th anniversary celebrations in June. Coming to more mundane matters, the society’s performance over the past year has been consistent with the anticipated depressed demand for language courses. Enrolment numbers are still declining but our consolidation efforts are beginning to pay dividends in terms of ensuring a reasonable balance between revenues and expenses. The first signs of a turnaround are beginning to emerge. For the first time in the past four years, we have been able to operate without financial support from the Dante Alighieri Foundation. Indeed, we have recorded a significant surplus for the year and thanks to some extraordinary income from fundraising activities at the National Multicultural Festival, we were able to make a modest reimbursement to the Foundation in relation to the advances received from it in recent years. Our language classes are primarily conducted in rented rooms at the Yarralumla English-Italian bilingual school, with smaller classes held at the Notaras Multicultural Centre where we can use appropriate spaces without incurring additional rental costs. The Notaras Centre is also used for our conversation groups, which despite the introduction of paid parking in Civic, regularly attract a substantial following. The Society’s cultural program has been offering an attractive and appealing range of cultural and social experiences to participating members. In addition to our lecture series we have continued to experiment the use of live teleconferences with Italian personalities. Two were held in 2016: the first early in the year at the Italo Australian Club and gave us an insight into the work of the mobile emergency assistance clinic which supports racers competing in the international Moto GP circuit; the second, at the Italian Embassy, gave us an insider view of the Rizzoli Orthopaedic Institute’s contribution to medicine and of some of the art treasures within its historic headquarters in Bologna. Our choir is in great demand and continues to be a formidable ambassador for the Society in Canberra and the broader region. The second of its CDs of Italian music is selling well and is available as a special when bought as twin set with the first CD. The choir continues to expand and anyone is welcome to join. We are indebted to its musical director, managers, musicians, lead singers and the growing number of members for their commitment and dedication. The Society continues to be a key contributor to the Italian community’s initiatives in Canberra. We helped organise the participation of Italian community groups in what has become known as “Piazza Italia” at the National Multicultural Festival. Most of the funds raised at the 2017 Festival will be going to assist the operations of the Italian Cultural Centre. 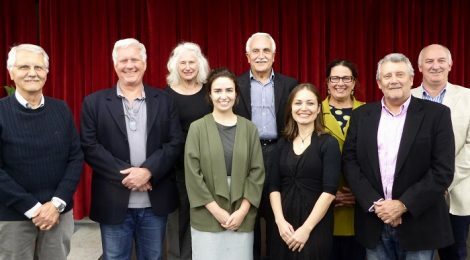 The Society was also a key supporter of the Italian Earthquake appeal that raised more than $50,000 and organised a spectacular multicultural concert to raise funds for the appeal. I take this opportunity to thank all the multicultural groups who performed free of charge and Domenic Mico who helped to organise the concert. The Committee will be undergoing a huge, unplanned change at this meeting. I have already mentioned that Yvette is stepping down, but she is not the only one. The departures include Tamsin Hong (vice- president), Francesca Foppoli (classes and teaching coordinator) and Alessia La Cavera. We thank them for their outstanding contribution to the Society. Our special thanks also go to the Treasurer Tony Hanrahan and to the Secretary Cristina Hurley for their extensive commitment in managing the affairs of the Society and to all the other members of the Committee: Luigi Catizone, Pauline Adams, Nicola Patini and Bruno Santagostino Baldi. I also gratefully acknowledge the support of our language class teachers and particularly of our volunteer conversation group leaders. Last, but not least, I thank all members for their continued support of the Society’s efforts in Canberra. ← Fun at the NMF!